Introducing the MortgageSense Mortgage Calculator, an easy to use automated spreadsheet enabling you to make the most from you mortgage planning. MortgageSense is a simple to understand, simple to use mortgage calculator which gives a complete month by month breakdown of your mortgage account throughout its full term. Whether you already have a mortgage, and wish to optimise your savings through overpayments or remortgaging, or whether you are just thinking about getting a mortgage and want to see how much you will pay and why, MortgageSense provides all the information you will need. Comes with full instructions. 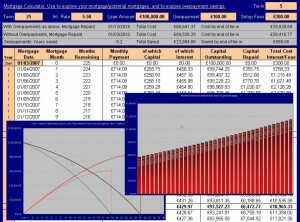 There are several Excel-based mortgage calculators available at the moment. Why choose this one? I initially created this mortgage calculator for myself in order to better understand the way a mortgage progresses through its term, and to explore the ways in which what one pays changes as interest rates and overpayments vary. There are many online mortgage calculators, none of which I found gave me the amount and flexibility of information I needed. I also wanted a very simple system that is quick and easy to use and explore with. Calculates your monthly payment based on number of years, interest rate and loan amount. Provides a complete month by month mortgage breakdown, whatever point you are at within your mortgage term. Calculates savings made by paying monthly overpayments. 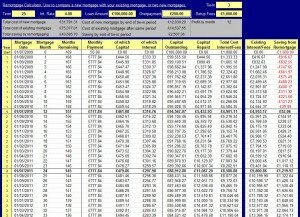 Can compare two separate mortgages with different setup fees, to see which is the most profitable and when. Can compare your current mortgage with those of a new mortgage (including setup fees), if you are thinking of remortgaging, in order to determine how much you will save by remortgaging in total, when these savings will commence (given a setup fee but lower interest), and how much you will save by the end of your tie-in period, after which you may wish to remortgage again. All this information is a clear, straightforward format. Clear graphs automatically generated, illustrating total balance and interest throughout your mortgage term, and illustrating capital to interest repayment on a month by month basis. For most people, their mortgage is the single largest financial commitment they make. Don’t remain in the dark, take control and learn about what you pay and why. All you have to do is enter your desired mortgage term, interest rate, loan amount and start date and the calculator does the rest. 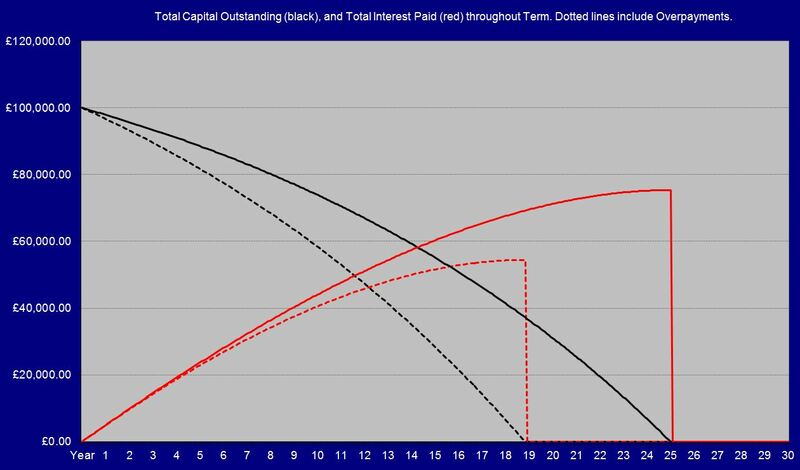 See clearly in graphical format how making overpayments reduces your outstanding capital more quickly, thereby reducing how much interest you have to pay. Enter any combination of mortgage term (years), interest rate and loan amount to see exactly what you will have to pay each month, along with how much of this goes to pay off your loan capital, and how much goes on interest. See exactly how the ratio of interest to capital you pay changes throughout your term on a month by month basis. See also how much capital and interest you have paid off cumulatively each month throughout your term. See exactly when your mortgage will be completed, how far you have to go, or the impact of any changes to loan amount or interest rate. Learn about overpayments, and see exactly how much you will save by making any desired monthly overpayment. See also the extent to which these overpayments will shorten your mortgage term. For example, on a £100,000 mortgage at 5.5% over 25 years, a £100 overpayment each month will save you nearly £24,000 in interest, and pay off your mortgage in less than 19 years! Now you can see exactly what you, personally, can save. Whatever your interest rate, whatever your outstanding loan, and however many years your term has left to run, you can experiment with various overpayment amounts to see exactly how much you can save. Even a small monthly overpayment of, say, £20 can save you thousands over a full mortgage term. By experimenting with different term lengths, interest rates and overpayment amounts, learn how to make the most of your finances over the course of your mortgage. Whatever your mortgage amount or interest rate, track your monthly payments and balance, and compare these to those shown on your mortgage statement, for complete peace of mind. If you already have a mortgage in progress, if you re-mortgage, or if your interest rate changes, simply enter your new details to see a full, completely corrected month-by-month mortgage breakdown. Full instructions are included, along with an explanation of how mortgage interest payments are calculated, and how overpayments save you money. 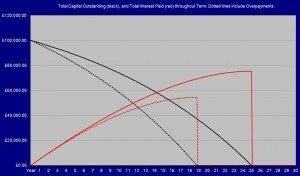 Numbers are indispensable, but, if you find these hard to visualise, see your mortgage in the form of two clear graphs showing 1) monthly payments and how much of these go on capital and interest, and 2) a cumulative picture of how much capital and interest you will pay off in total as your mortgage term progresses. Both graphs include a second set of dotted lines which illustrate your mortgage if you pay overpayments. These clearly illustrate the impact of making overpayments. Nothing is hidden or locked. For those with experience of Excel, you can study the formulae in order to learn exactly how the calculator works, and even modify and expand it to suit your own requirements. Thinking about remortgaging? 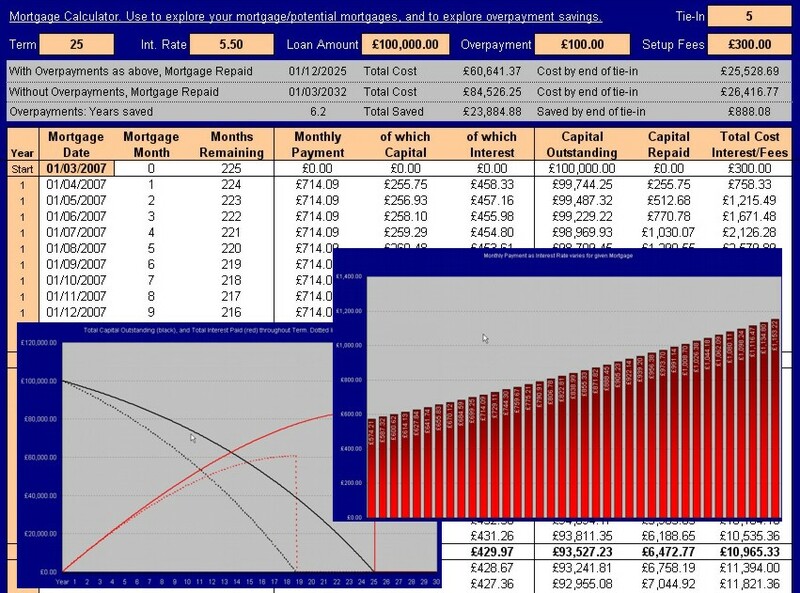 A common question is: “if I switch to a lower interest rate, but have to pay a setup fee, will I save money in contrast to my existing mortgage?” The calculator incorporates a second “remortgage calculator”, which enables you to enter your proposed new interest rate and setup fees, and compare what you pay on a month by month basis, with your existing mortgage. You will see that initially you pay more, due to the setup fee, but then, as interest is charged at the new lower rate, you eventually offset this initial cost and move into profit. The calculator shows you exactly when, and by how much. It also summarises your total saving by remortgaging after your remaining term, and also by the end of your tie-in period, after which you may wish to remortgage again. Separate mortgage calculator for interest only mortgages. The MortgageSense mortgage calculator costs just £9.99. To purchase, simply email me on mat@matmackenzie.co.uk or call me on 01303 770340 and I will provide payment instructions (secure payment by PayPal). I will then send you download instructions. DISCLAIMER The MortgageSense mortgage calculator is accurate to the best of my knowledge, and has been rigorously tested. However, the creator of this software and its accompanying instructions accepts no liability for any loss or damage, including but not limited to financial loss, resulting directly or indirectly from the use of MortgageSense, or resulting from any inaccuracies or errors contained therein. This software is provided for general interest only. A certificated advisor should be consulted before making financial decisions. By using this software, you agree to these terms. Clearly, no-one can predict the future, or say for sure how interest rates may vary over the course of your mortgage. For this reason, calculations are based on your current interest rate throughout the term. If and when your interest rate changes, simply update the rate, your remaining term and remaining loan amount, and the calculator will update automatically. In this way, the calculator is also suitable to those with variable interest rates. REQUIREMENTS The Mortgage Calculator is an Excel spreadsheet file. You must own a copy of MS Excel in order to run it.